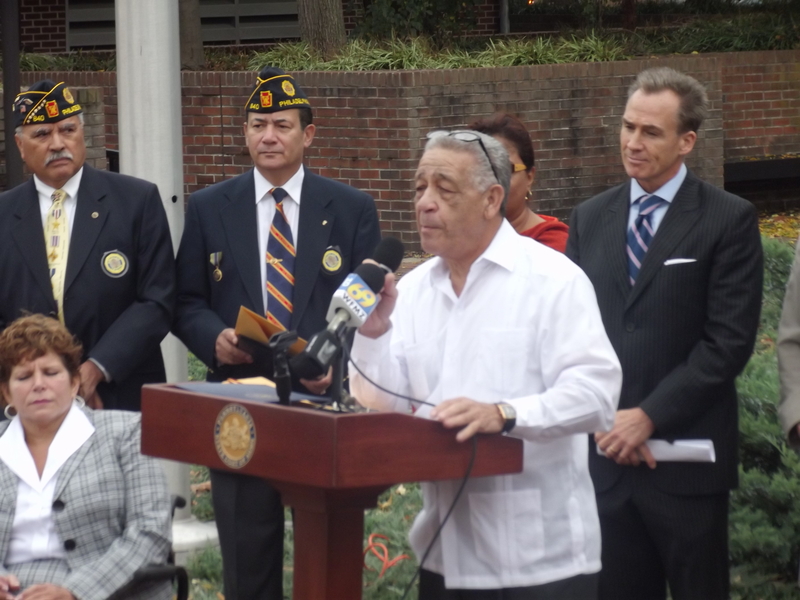 Philadelphia – “Si Podemos Hacerlo,” was the upbeat message candidate Mike Stack often delivered to the Latino community in his race for Lt. Governor. But the newly elected Lt. Governor of Pennsylvania was rendered speechless as he was serenaded by chants of “Stack, Stack, Stack,” at the Sheet Metal Workers Hall, Tuesday night, as a boisterous crowd of hundreds of Philadelphia-area Democratic party officials and labor organizers cheered a victory by their hometown State Senator and Tom Wolf. “Labor (was) the key,” said State Sen. Stack, acknowledging the crucial role of union support in a Democratic victory that contrasted with Republican sweeps in gubernatorial and senate races across the nation.. In a brief nine minute victory speech from his hometown of York, Mr. Wolf referred to William Penn and touched on the major themes of his campaign: establishing education as a “priority”; economic development and job creation; inclusion; and “taking advantage” of the state’s natural resources. Both Alexandra Rivera and Mimi Aponte were particularly hopeful about the prospects of the new Governor raising the minimum wage. “I really hope he does it,” said Ms. Aponte, referring to a raise in the minimum, an issue that impacts tens of thousands of women workers in Pennsylvania. A late afternoon rally at 6th and Market Sts. echoed that same message. With two of the nation’s top union leaders, Mary Kay Henry, President of the Service Employees International Union (SEIU) and Henry Nicholas, President of the National Union of Hospital and Health Care Employees 1199C, leading local health care workers in a last get-out-the-vote effort on behalf of the Wolf-Stack ticket, they reminded workers of the need for an increase in the minimum wage. “Today we’re voting to make a change so that everybody who works hard for a living can live a decent life. So that people with disabilities can live with independence,” said SEIU Pres. Mary Kay Henry, addressing some forty to fifty health care, child care workers, individuals with disabilities and fast-food restaurant employees. Describing health care and fast food workers as “heroes” who are working in the ‘fastest growing’ job sector in the nation, Ms. Henry asserted, “We are bound and determined to make these family-wage jobs that people can raise their children on and retire.